STOP HS2 | HS2 already costing £13m per month, as Stage 2 delayed until after legal hearings. HS2 already costing £13m per month, as Stage 2 delayed until after legal hearings. 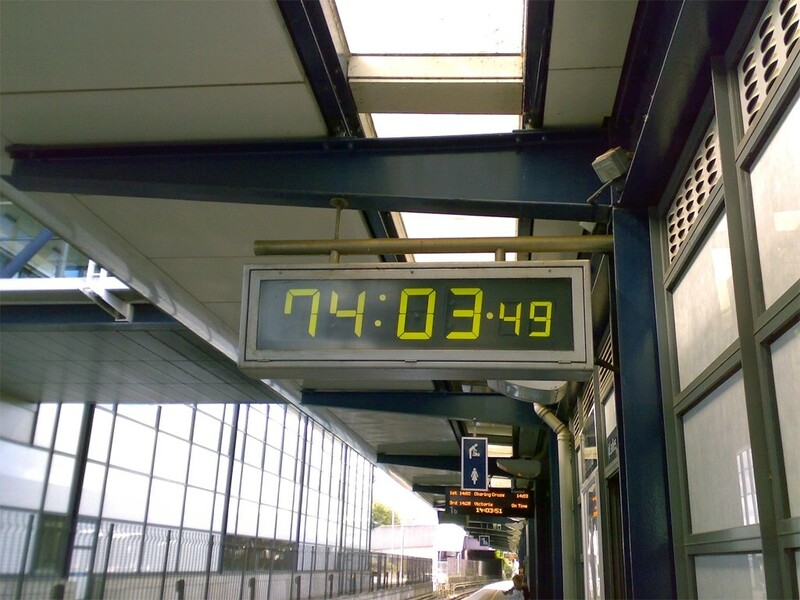 The clock at the HS1 station in Ashford which the HS2 timetable seems to be based on. An army of consultants and new staff has seen the costs of the HS2 project almost treble from £4.7m per month in the 2011-2012 financial year to £13m per month in the first five months of the current financial year. In a written response to question from Cheryl Gillan MP, the newly appointed Transport Minister Simon Burns listed total expenditure rounded to the nearest whole number as £9 million for 2009-10, £24 million for 2010-11, £56 million for 2011-12 and £65 million so far for 2012-13. Oddly, the Press Association reported this as “HS2 project has cost £65m so far”, which would have more correctly been reported as “HS2 project has cost £65m in the five months from April to August”. In fact, the project has cost £154m since 2009 with 42% of that being spent since April. Costs are set to keep rising, as since January HS2 Ltd have taken on new staff and signed consultancy contracts in excess of £102m, all of which have to be completed in time for the deposition of the Hybrid Bill, scheduled for this time next year. Whilst HS2 Ltd have already started tendering for consultants associated with Stage 2 of the project which would consist of the links to Heathrow, Leeds and Manchester, Minister for Transport Simon Burns has announced that there has been a further delay in the publication of these routes, which will not now happen until December, leading to speculation that the Government are waiting for the outcome of five legal challenges which will be heard from the 3rd of December. Is there a weblink to an official source for that statement from Mr Burns? I’ve been unable to find one on Hansard or the DoT wesbite. There’ve been lots of written questions on HS2 recently making it hard to find specific ones. It would not surprise me if the DfT’s plan B is to consult on stages 1 and 2 together should they lose the judicial reviews and have to consult again. I don’t really have a view on the merits of the other judicial reviews but the whole compensation saga is beginning to look like a shambles and I fully support the legal action that is being taken in that regard. Supporters may see this as a side issue, unfortunately for those of us who live close to the line it is potentially life changing. No Nick –what we are alarmed by is the shambolic management and processes and the shocking waste of public money.